London’s Underground platforms launched free-WiFi last month, now’s the turn of above-ground. Reliability will become a big issue as usage rises, especially since it is free. The network has built “fast, free, reliable” hotspots across the West End, with downloads at upt to 24Mbit/s, as part of a deal with Westminster Council. 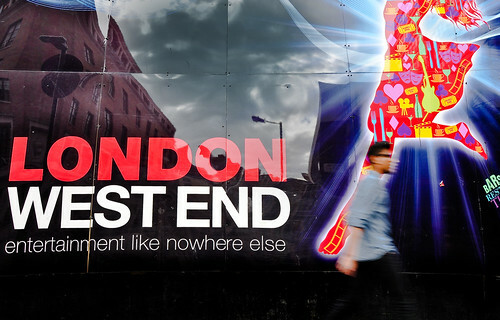 Street scene in London’s West End. Photo by Prasad Kholkute. Users will have to register, but unlike Virgin Media’s network on the London Underground, O2’s hotspots will remain free after the Olympics are finished. The mobile network aims to support its investment by selling advertising to local businesses, with the department store House of Fraser first to back the idea. As more advertisers come on board, it is envisaged that they will offer deals based on people’s location on the network. West End theatres could promote last minute tickets to those nearby or restaurants could attract new customers with lunchtime discounts. “With millions of extra people coming to town for the Games, we want to ensure we showcase the capital as the best city in the world to work and visit, and the addition of free wifi to some of our most popular landmarks is crucial in helping to maintaining that reputation,” said Boris Johnson, the Mayor of London.